I have two of these that I've been using for years. They're rated #1 by Cooks Illustrated. Here's what they said: "Good crisping and browning, a see-through bottom to monitor the bottom crust, a half-inch rim, shallow, angled sides, and a low price made this our winner—again." No more burnt pie crust edges! I love this inexpensive gadget. Now all of my pie crusts get eaten instead of left on the plate. I bought this 7-speed mixer after see it recommended by Cooks Illustrated. I often find it easier to use this powerful little work horse, instead of getting out my big stand mixer. It's what I use for mixing my pecan pie filling. 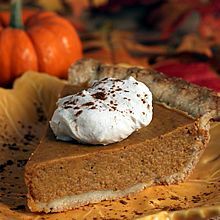 If you're looking for more pie recipes, this is a great collection from Fine Cooking magazine. This is my Grandma's recipe--an old time family favorite. Preheat oven to 350 degrees. 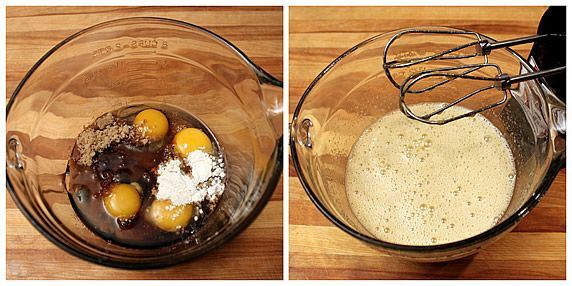 In large mixing bowl, combine light & dark corn syrup, eggs, brown sugar, flour, and vanilla; beat well with electric mix (approx. 1 minute on med-high speed). Stir in melted butter and pecans. 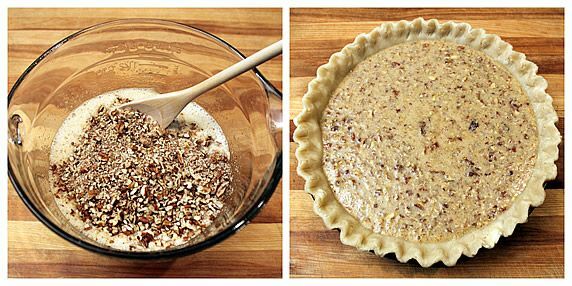 Pour into prepared pie shell. Bake 45-55 minutes until golden brown and puffed all over; when jiggled gently, center should be firm with no visible liquid moving. Cool. Serve plain or with whipped cream. 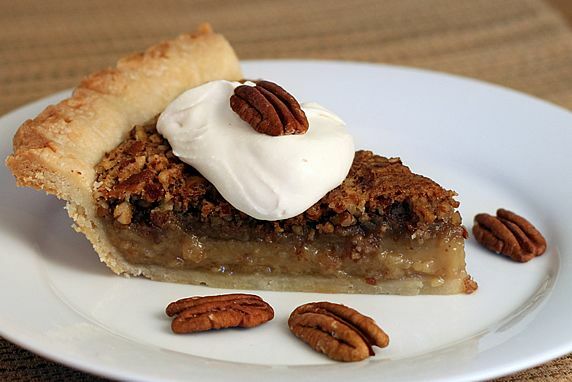 This is my Grandma's pecan pie recipe. I've been eating it all my life. Grandma taught me how to make it, along with her pumpkin pie, when I was in high school. Her pecan and pumpkin pies are the only two pies that I make for Thanksgiving. Always. When I put Grandma's pies in my oven first thing on Thanksgiving morning, I feel like I'm back her kitchen cooking with her. I love that about recipes that get passed through the generations; especially on holidays. My family loves my pecan pie; especially King-Man and Bracken. But to me it can never taste quite as good as Grandma's. Maybe it's because she used pecans she gathered and shelled from the pecan trees in her massive garden and orchard, and I buy mine from the grocery store. Maybe it's because she cooked her pies in her country kitchen and everything that came out of her memory-filled kitchen simply tasted better. 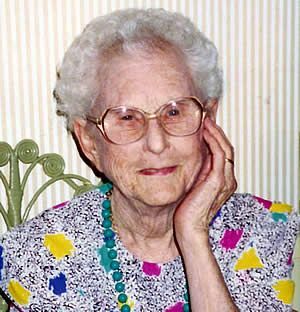 Here's my Grandma on her 90th birthday in Abilene, Texas in 1992. She passed away a couple of years later. Her name was Ruby, and she was a real gem. 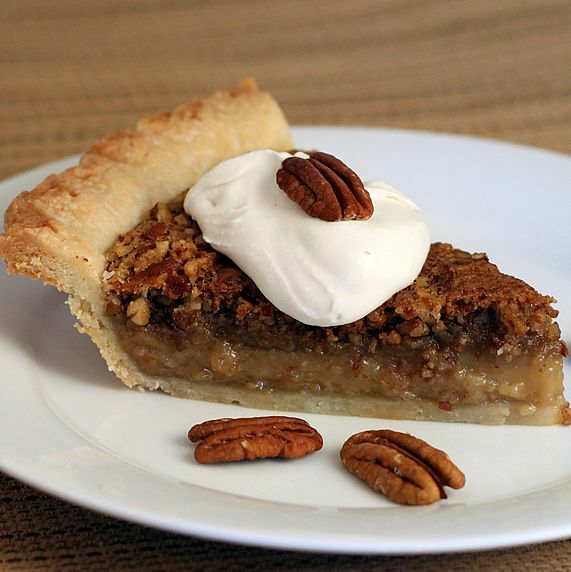 This is a classic pecan pie recipe, and is really easy to make. 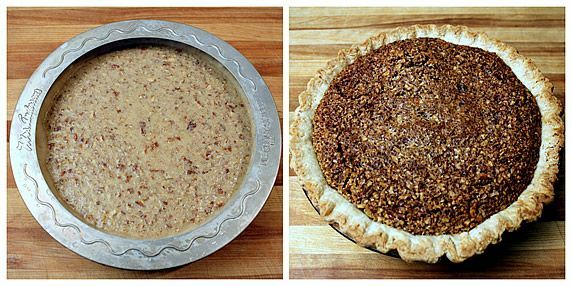 Some people prefer to use pecan halves without chopping them, and I do think the finished pie looks prettier that way. However Grandma always chopped her pecans pretty small. 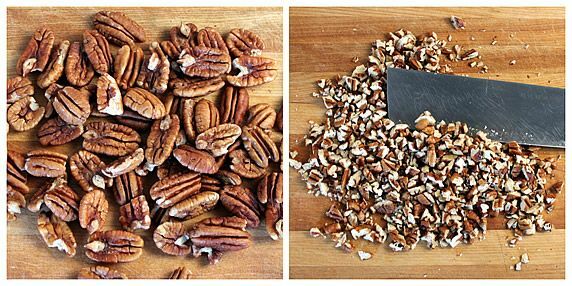 That makes it much easier to cut clean pie slices (it's hard to cut through the pecan halves evenly), and Grandma would say it's "better eatin'" when the pecans are chopped. Step 2. Chop the pecans and melt the butter in the microwave. Set these aside; they get stirred in at the end. Step 3. 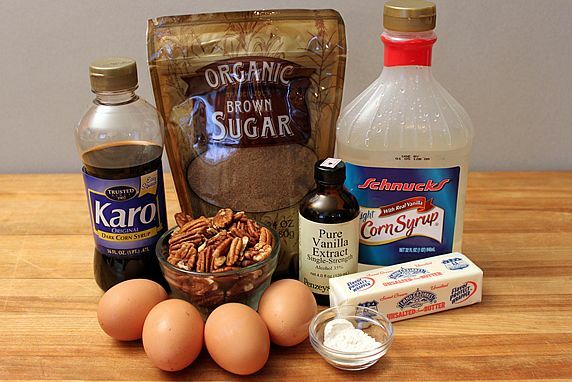 In a large bowl, combine the eggs, corn syrup, brown sugar, flour, and vanilla, and beat well with an electric mixer--about 1 minute. Step 4. 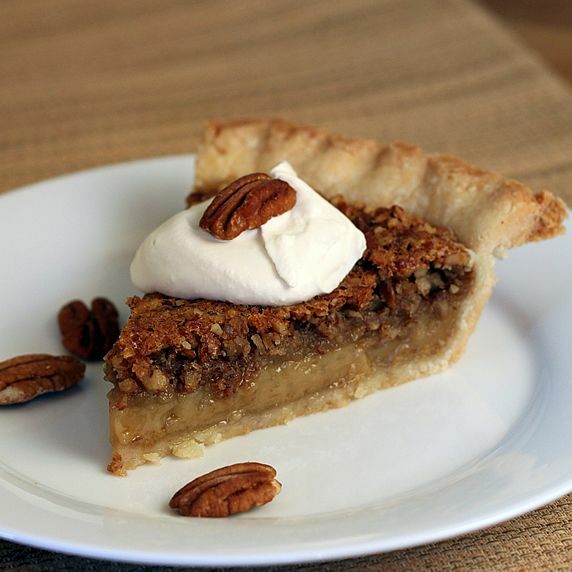 Stir in the pecans and melted butter and pour into a prepared pie crust shell. Step 5. Bake until the pie is puffed all over, golden brown, and firm in the center (when you jiggle it gently, there should be no sign of liquid in the center). My all-time favorite pie gadget is the pie crust shield pictured below. For years, my crusts would burn before the pie was cooked. I tried putting aluminum foil around the edges, but it was a pain because it fell off too easily. There are other pie shields I tried that were several metal pieces that can be rested around the pie crust edge; again those easily fall off. This one-piece pie shield is the best; simply rest it on top of the pie crust and it stays put. No more burnt pie crusts! I love these so much that I've given them as gifts many times. Here's a slice of Grandma's pie, a.k.a. a little slice of heaven.